Summary: This is the musical episode with puppets. And it’s the best of the season. Good job, Community. Good job. I wasn’t sold on this episode at first. 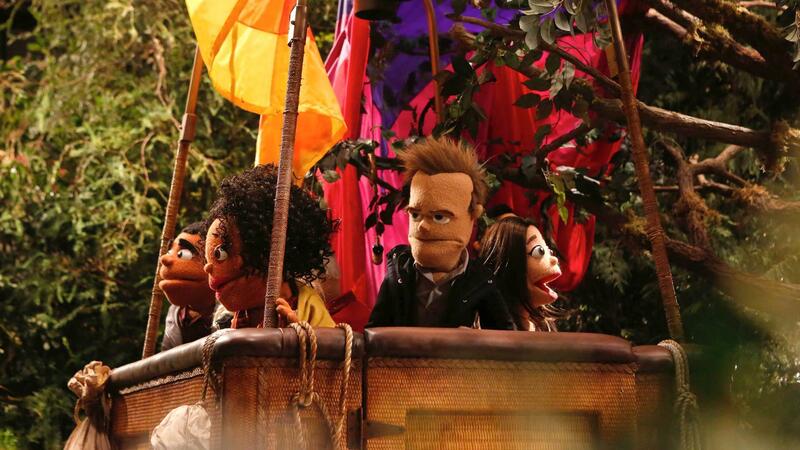 “Let’s do an episode with puppets! That’s weird and different and high-concept, right?” sounds like something the down-and-out showrunners might throw out, devoid of ideas and reaching for anything to drag the Paintball fans back kicking and screaming. Yeah, Community got famous when it started doing the high-concept stuff, but it also had to walk on a thin rope to keep it from losing its soul and characters to the weirdness. While this season has been pretty good, it’s also been very safe and never quite dipped its toes into the full weirdness the show could provide. It would be easy to either go way too all out with the puppet jokes, or keep their cards too close to their chest and waste the opportunity. But wow, was this a surprise. “Intro to Felt Surrogacy” feels a little off at first, because—despite what people have said about this being “like old Community!”—it’s very, very different. But it leaves a definitively good feeling when it wraps, and only gets better with each subsequent rewatch. I don’t want to call it “warm and fuzzy,” but…warm and felty, sure. What works here is that in the midst of the high-concept stuff and weird plot (a hot air balloon? Jason Alexander as a mountain main who gives a group of puppets psychotropic berries?) is an incredibly simple story. This is essentially another episode solely taking place in one room to yield character development, akin to “Advanced Dungeons and Dragons” or “Remedial Chaos Theory.” The puppet concept supplements the characters; there aren’t even many jokes about them being puppets, they’re just another part of the structure. It’s a bit more low-key as a result, but it means it’s less “Basic Lupine Urology” and more “Remedial Chaos Theory”—both are fantastic, beloved episodes, but only one of those is universally considered one of (if not the) best episode of the show because of its heart and character-centric material. This is “the episode with the puppets” on the outset, which lets them do the ridiculous hot air balloon stuff, but the meat of the story isn’t one that needed the puppets. They just make it better. Part of that is how the show emulates the feel of puppet-centered films and shows. No one ever directly mentions The Muppets, for example, and yet this functions as a fantastic homage to that entire franchise. It might be one of the best homages the show has done, actually, because it isn’t out to parody it; it’s out to recreate how it makes the audience feel. The Muppets are funny and they throw out witty pop culture references, but they’re characters we can care about. There’s something inexplicably warm about The Muppets, sort of like how we respond to dogs and cats, and even their simple designs yield bigger emotions than plenty of human characters. But they never feel sappy, and we leave just feeling, well, happy. “Intro to Felt Surrogacy” is exactly that; it’s simple, and even though it delves into some darker moments for the characters, it’s just so darn happy that you can’t walk away without being in a good mood. The show has never not done a musical sequence well, and this episode is no different. We get to hear much more of Yvette Nichole Brown ‘s voice than we have in the past, which is nice. The whole cast does surprisingly well with the material, but Brown is obviously the best singer here, and she gets great use. The songs are appropriately simple and straightforward, but do what they need to get the character development across. And they’re catchy; the gang’s “That’s an Adventure” in particular is quite the earworm. Using the tried-and-true trope of having the musical sequences reveal inner secrets was great here, too. Annie’s secret is admittedly a little weird, but fits into her ever-growing abuse of her own sexuality (see “Regional Holiday Music” and, as much as I didn’t like how she was used in it, “Conventions of Time and Space.”) But Jeff’s secret was a welcome gut-punch, suiting the darker turn his parental issues have taken this season. Pierce’s Eartha Kitt reference was easily the funniest (and yet still fitting) of the group, and the reaction to Britta’s activism was great. The snappy dialogue was the best it’s been all season, with tons of one-liners, both overt and subtle, crammed into every discussion. It all feels natural, too; from Britta and Shirley’s mini-argument, to Troy’s non-sequiturs, to Abed’s Lost references, these are the characters’ voices at their best. Andy Bobrow, the episode’s credited writer, is one of the strongest veterans of the show, so it’s not a surprise to see good work. But even at that, in addition to being heartfelt, this is probably the funniest the show has been all season. “Intro to Felt Surrogacy” is a really, really good episode of Community on first viewing, and a great one on subsequent rewatches. But it makes the rest of the season, which I’ve fiercely defended for the most part, seem a little less good in comparison. It’s a little frustrating, actually; these creative juices were clearly flowing throughout the season, pieces of brilliance bubbling, but they haven’t been utilized until this late in the game. I’ve enjoyed this season overall, but even the best episodes have admittedly been pretty good or surprisingly decent, not great. This season hasn’t been a waste of time, but for a potential final bow, it’s been noticeably not memorable up until now. If the final four episodes strike the balance “Intro to Felt Surrogacy” did, between heartfelt emotion, big laughs, and genuine fun, hopefully the overall feeling will change. It would be sad to see a show so memorable and ripe for dialogue peter out at the end, especially when it can craft episodes as successful as this. But at least if we’re feeling down about that, we can pop this episode in and walk away with a smile. Jason Alexander had an odd, brief role here; it wasn’t genius casting, but he wasn’t used as badly as, say, Michael K. Williams last year. And his stunt casting wasn’t the focus, which was good. Despite never once being seen on screen in person, Chevy Chase’s voiceover work is one of the best performances he’s put forth in this show. The puppets themselves were, of course, beautifully crafted. Jeff’s eyebrows are a great touch…and let’s not even get into the pecs. While I’ve lamented that the “relationship” between Jeff and Dean has gone a little far at times this season, we have a lot of great moments here. Jim Rash delivers everything perfectly, but his “How could you almost let him die? !” freak-out is a highlight. There’s no way to not love the reference to Professor Duncan. We all miss you, John Oliver. I didn’t understand the moose gag, but I loved it. Viewers who’ve always wanted that Britta/Annie fanservice finally get to see Britta lovingly caressing Annie…as puppets.